Okay, confession time, guys—before seeing “The End of the Tour,” I had absolutely no knowledge of either David Foster Wallace or his significant novel, Infinite Jest. After watching the fictional film about a few days in his company (which, as far as I can tell, is mostly accurate), I feel like I should read the novel and get into Wallace’s mindset even further. Directed by James Ponsoldt (whose previous film was “The Spectacular Now,” one of my new personal favorite films), “The End of the Tour” is not a biopic about the life of a troubled artist but a slice-of-life film about a reporter’s interpretation of said-troubled artist while spending five days with him. The result is a comedy-drama that is honest, insightful, a great balance of drollness and pathos, and brilliantly acted. It’s one of the best films of 2015. 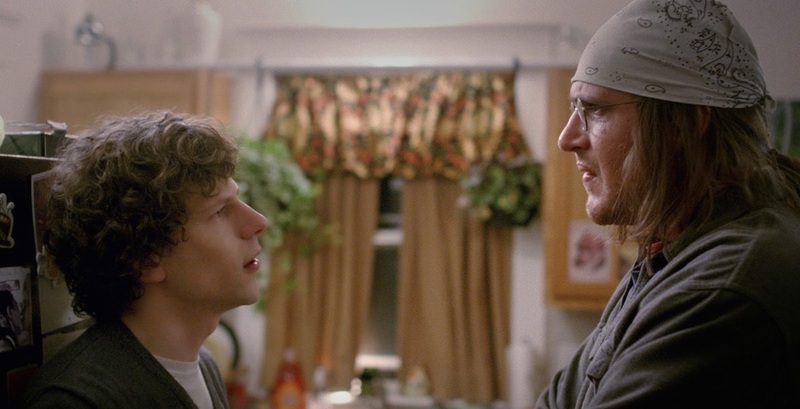 The story is told in flashback in 1996, when writer David Lipsky (played by Jesse Eisenberg) is assigned by Rolling Stone to join David Foster Wallace (Jason Segel) on the last few days of his multi-city book tour. He gets to know the offbeat Wallace, keeps his tape recorder handy and running most of the time, and the more he gets to know what kind of person he is, the more hesitant he is to ask him what his editor is demanding to know: was Wallace addicted to heroin? I’ve always liked Jason Segel in his comedic roles, but with his performance as Wallace, he shows a side I haven’t seen before. He’s brilliant, portraying an artist who is trying to hide from the world while observing modern (or, pre-9/11-modern) society’s pros and cons (at one point, it’s revealed that he himself is addicted to trash TV), and he’s terrified of fame for numerous reasons (some obvious, others understated). There are many levels to Segel’s performance that are fascinating to interpret; to see this film is to admire this performance. Jesse Eisenberg’s role, who is technically the film’s main character, doesn’t require a stretch in range for the actor who has given similar performances before—as the twitchy, brainy, self-absorbed, quick-witted person who has a heart of gold—but Eisenberg still does an effective job here. Also to be admired is the screenplay by Donald Margulies, adapted from the real David Lipsky’s reflective novel, Although Of Course You End Up Becoming Yourself. The conversations Lipsky has with Wallace are great and fascinating to listen to, with a great amount of pitch-perfect dialogue. It’s a long shot for the film to get a Best Adapted Screenplay nomination come Oscar-time, but I would cheer if it did. With a fantastic script, a remarkable performance from Segel, and numerous effective moments that are dramatic, humorous, or both, “The End of the Tour” is a film I won’t forget anytime soon. I see a spot open in my year-end list for the best films of the year. I love this movie.